With the presence of a large number of players that offer application-specific products, the global functional apparel market is fragmented, states Transparency Market Research in a new report. Players in the market are investing substantially in innovative technology to introduce novel products that offer flexibility, durability, and comfort. Research and development to introduce eco-friendly fabric to serve the demand for eco-friendly performance clothing is also the focus of players in the functional apparel market. Such initiatives will help market players expand their brand into new categories. 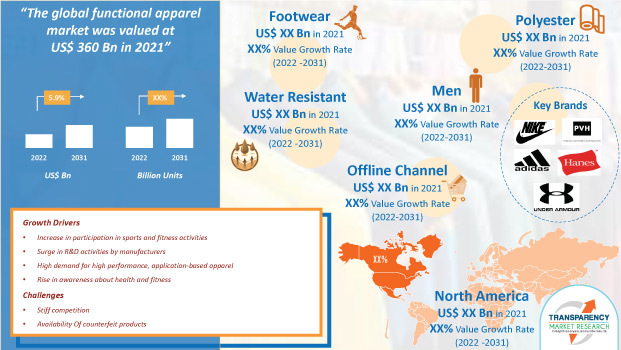 Prominent names in the global functional apparel market include Addidas, Columbia, MIZUNO Corporation, New Balance Inc., Icebreaker, Wacoal, Calvon Klein, Hanesbrand Inc., and French Connection among others. According to estimates provided by a TMR report, the global functional apparel market is anticipated to clock an impressive 13.5% CAGR during the forecast period between 2017 and 2025. At this pace, the market will be valued at US$244.61 bn by the end of 2025. On the basis of type, the functional apparel market is divided into sportswear, outdoor apparel, footwear, socks, and innerwear. Of them, the footwear segment is anticipated to display faster growth rate over the forecast period. Region-wise, North America is anticipated to emerge as the leading regional market for functional apparel over the forecast period from 2017 to 2025. As individuals are adopting physical activity and fitness regimes, the demand for sportswear apparel and footwear with sweat-free, antimicrobial, and anti-odor features is anticipated to be on the rise in the region. Majorly fuelling the growth of the functional apparel market is rising demand for high-performance, application-specific apparels and footwear coupled with the rising participation in sports and fitness activities. Functional apparels manufactured using advanced technology are usually made of polyester fabric or microfiber that absorbs sweat from the body on the fabric’s surface, from where it is evaporated. These apparels thus help athletes to stay dry and comfortable. The rising interest in sports and fitness activities over the past couple of years is a key factor driving the functional apparel market. Changing fashion trends and rise in the number of working women will stimulate the demand for non-athletic footwear. Further, the growing awareness of importance of health and fitness is likely to stir the demand for sportswear and footwear in the upcoming years. Increasing inclination of individuals towards fitness is encouraging them to get involved in gym or personal training activities so as to remain healthy and active in daily life. Worldwide, work-related stress and consumption of high-calorie food has aroused health consciousness among individuals. Individuals have become selective about apparels they wear for gym sessions, personal training, and even casual work. The trend is likely to be prevalent in developed regions. The strong presence of some major players also account for prominence of developed regions such as North America and Europe. The adoption of scientific principles in the manufacture of functional apparels offer protection from heat, radiation, extreme cold, and chemicals. These attributes help functional apparel find special potential among technology-savvy users. Highly engineered athletic footwear helps in improving athletic performance and helps reduce injuries. Rising incidence of skin allergies and foot allergies is driving the demand for sweat absorption and anti-bacterial features in functional apparel.